I feel like the second the leaves start to lose the slightest tinge of green, we are pretty much bombarded with pumpkin EVERYTHING. A recent foray to the Trader Joe's in Rochester cemented this for me - pumpkin macarons? pumpkin scone mix? pumpkin cream cheese? Pretty much pumpkin ANYTHING. I'm not all that gung ho for the ubiquitous orange blob, and generally leave my pumpkins for carving and seed roasting. However, Lil Z found her own little pie pumpkin in the pumpkin patch, on a flash-lit pumpkin hunt with her Sparks troop, so I really had no choice but to do something with it, lest it rot and she be devastated. So I decided to make pumpkin muffins. 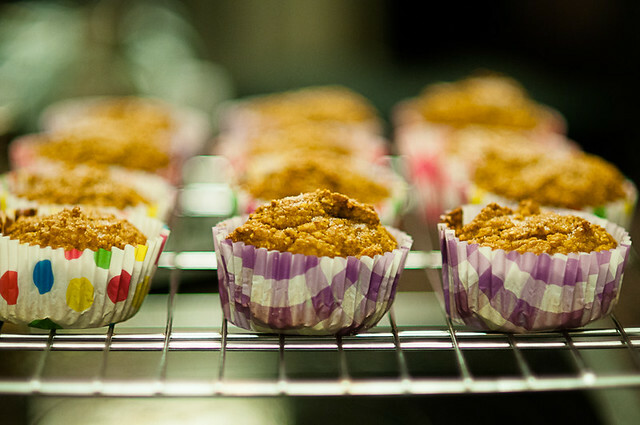 And I discovered that it's really hard to find a reasonably healthy pumpkin muffin recipe. I find that life is already full of too much white flour, excess sugar and blood-sugar spiking treats, so when I actually get my schmidt together to make something, I'd prefer it be healthier (and less like cake in disguise). I eventually found a recipe that fit the bill - these were really tasty - they aren't particularly sweet, and I'd be tempted to replace 1/4c. of the pumpkin puree with oil of some sort, but they are quite delicious. This batch would make about 18 muffins, but I made 12 muffins and 30 baked mini-doughnuts (just pipe the batter into the pan and bake for about 10 minutes. 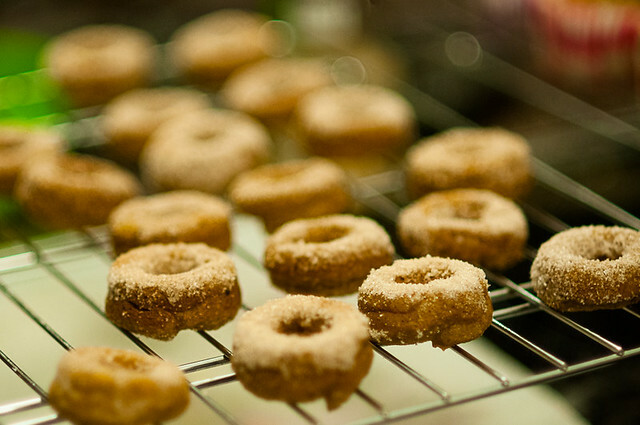 I immediately dipped the mini doughnuts in cinnamon sugar, and next time, I'd do the same to the muffins - the recipe could possibly use a bit more sweetness (but not too much; remember, we're not making cake!). You have to love the fun papers too, eh? I picked those up from Dollarama - 60 for $1. 1. Preheat oven to 350 degrees. Grease a muffin tin or line with paper liners (pro tip: you can spray the liners and they won't stick to your muffins). 2. In a large mixing bowl, mix together honey, eggs, pumpkin, vanilla and water (since I didn't puree my pumpkin, I just put these in a mixing bowl and whizzed it with my immersion blender). 3. In a medium sized bowl, whisk together flour, oatmeal, baking soda, salt, cinnamon, nutmeg, allspice, powdered ginger and ground cloves. Combine dry ingredients with the wet. Stir until just blended. 4. Fill each muffin tin 3/4 full. Bake for 25-30 minutes. Makes 18 muffins (or 12 muffins plus 30 mini-doughnut). If you want to make cinnamon sugar, just combine 2 T of sugar with about 1/2 t of cinnamon. Dip the muffin tops/doughnuts while still hot and steamy. Success! I cooked the pumpkin as you suggested, but added a bit of water to the bottom of the dish as I was afraid it would dry out. I only had one egg, so I substituted the other egg with a banana. And then I just sprinkled the sugar and cinnamon right on top before baking. They are quite moist and the boys seem to really like them! Wait, how much applesauce? It says in step 2 to mix applesauce with wet ingredients, but there isn't any applesauce in the ingredient list. Am I blind? Heather - you are totally right! The initial recipe called for a mixture of pumpkin and applesauce, but I decided to use all pumpkin, but forgot to take the applesauce out of the directions.